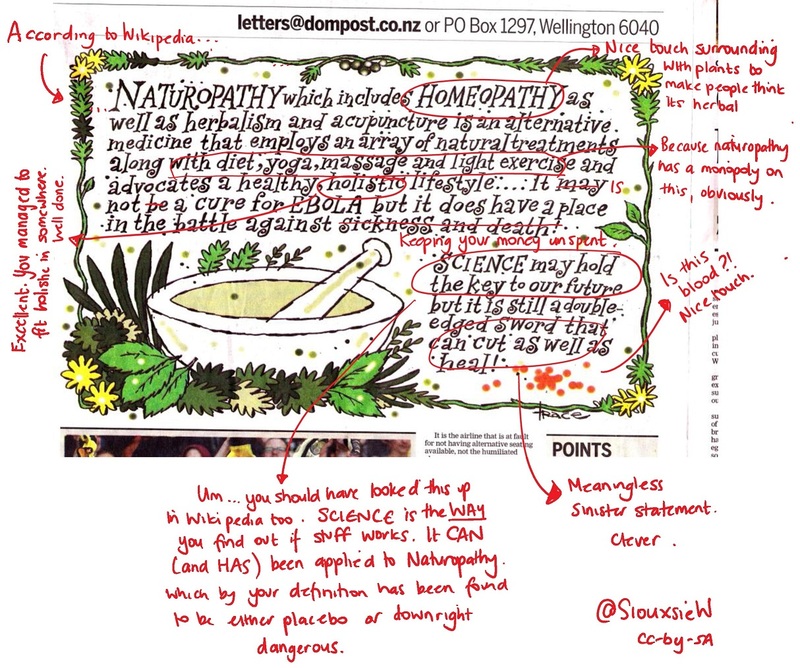 Today Wellington’s Dominion Post newspaper ran a piece of (in my opinion..) misleading propaganda they passed of as a cartoon which can be summed up as naturopathy vs science. I assume it is in response to the bad press that homeopathy received last week after Green Party MP Steffan Browning signed a petition calling for the World Health Organisation to start using homeopathy to treat people in west Africa with Ebola. I had the pleasure of explaining what homeopathy is on breakfast TV. Inspired by the fantastic @WieldARedPen on twitter, I fixed the cartoon. Enjoy! Yes, the blood touch was a bit rough I thought. ha, naturopathy isn’t even a single edged sword. Naturopathy is a cult below the rest……. It’s the age-old ‘pick the best things out of your product (e.g. it advocates health) and contrast it with the worst things of your competitor’s (e.g. science came up with the nuclear bomb)’ trick. Works every time.